Seago’s Spirit 240 comes with a wooden slatted floor and a slat underside. 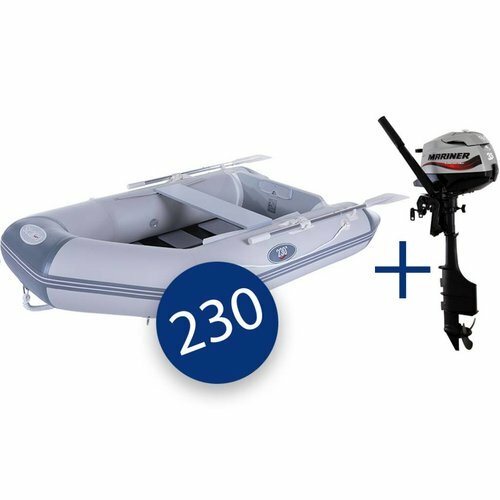 The inflatable dinghy is made out of a robust and sturdy 1100 Decitex 900g PVC material that is further protected by an anti-splash rubbing strake. Read more..
Seago’s Spirit 240 comes with a wooden slatted floor and a slat underside. 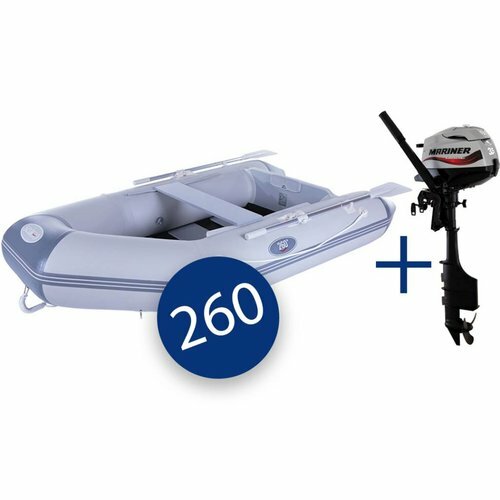 The inflatable dinghy is made out of a robust and sturdy 1100 Decitex 900g PVC material that is further protected by an anti-splash rubbing strake. Four grab handles are on each side of the inflatable tender; these grab handles can be used to hold on to whilst traveling or in a man overboard situation. They can also be used to carry the dinghy whilst off the water, instead of it being dragged along the surface and sustaining un-needed damage. 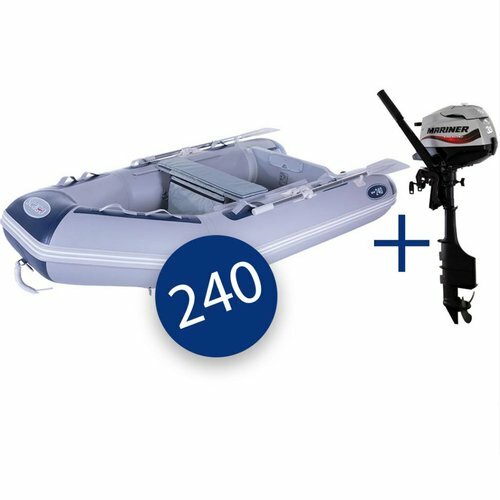 Next to the grab handles you’ll find two aluminium oars which come as standard with Seago’s 240 inflatable dinghy, which is great if you don’t want to use an outboard engine. If you do want to use an outboard engine, the 800mm seat is adjustable so you can find the best position regardless of whether you’re rowing with the aluminium oars or are using an outboard engine. A foot pump is also included. What is the maximum recommended horse power engine that can be used with the dinghy? How many people can the dinghy hold? A maximum of three people. What are the dimensions of the dinghy? (L x W) – 2400mm x 1340mm. What is included with the dinghy? Stainless steel towing eyes, A carry/storage bag, repair kit and aluminium oars. What is the packed weight of the dinghy? Stainless steel towing eyes, Pump, Aluminium oars. Mariner 4-Stroke outboard engines are incredibly clean and efficient, with enough torque to get you zipping around on your dinghy! With CD Ignition for easy starting, smooth smoke-free operation, and a 'through' prop exhaust that muffles exhaust sound by releasing it underwater. Some of the lightest outboards in their class, and with some great features such as convenient multifunction tiller handle that provides easy one-handed operation, and automatic reverse hooks, make this a desirable outboard for any use. Easy to carry thanks to the chunky handle and cutout in the cowl, there's also a convenient oil level indicator, and many more useful and high performance features, the Mariner Outboard is ideally suited to navigating the marina or further afield, with the outboard getting a normal dinghy up onto the plane without a problem. - Offers even more torque at same weight! - Durable design providing easy access for operator. - External fuel shutoff valve. Can be laid on three sides safely. - Rugged, safe to transport and store. - 3.5hp offers more horsepower with the same weight of competitive 2.5hp. - Easy to carry and transport. Fuel requirement: Unleaded 90 RON min.